Mulch fall leaves back into the soil to improve soil health and that of your plants. Raking leaves off of your the lawn always seems like a lot of work. Wouldn’t it be alright to leave them there to let them decompose on their own just like in the forest? Well, in forested areas, leaves fall where they may and break down at their own pace. They drop around understory plants and form a protective layer over the soil. In urban areas, and in particular your lawn, it is a different story. 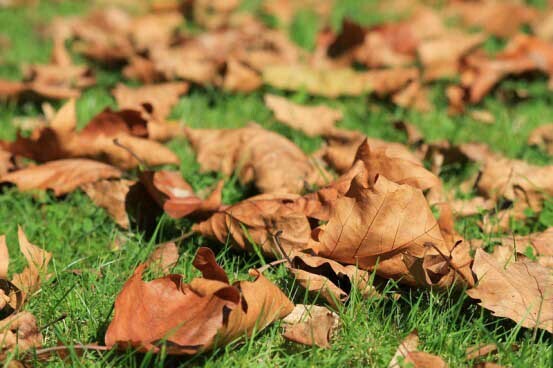 Too much fallen leaf build up on your lawn can cause problems. But there are ways to still use this valuable free source of organic matter. Different types of leaves break down at different rates. Pecan foliage falls a little earlier and crumble up rather easily. Oak leaves, which are quite prevalent in our area, are very slow to decompose. They tend to matt together and retain moisture and also block out light. Not a good situation for grass, especially in shaded areas that might already be struggling with thinning turf due to lack of sunlight. Damaging fungal diseases readily develop in dark moist areas such as this. We all know how many bags can accumulate from raking leaves in large yards. Because they are a free source of valuable organic material, it’s worth it to consider composting some or all of the leaves if you have space to pile them up instead of bagging them. Remember they will be quite slow to break down on their own. You can speed the process if you turn the pile regularly to provide some oxygen. Adding grass clippings or other quick decaying items like coffee grounds and vegetable wastes will hasten their break down. As we’ve mentioned before, you can use a mulching mower over leaves on your lawn to shred them into small particles that trickle down through the grass blades. The nutrients from this organic matter feed the soil beneath your lawn and improve the microbial activity for overall soil health. Depending on how thick the leaves are, you may need to rake the larger bits away after mowing. You might find areas of your landscape where leaves can be used under shrubs or hedges. If you’re worried about appearances, it might work best to try this in less visible spots since this is not the most favored look in urban areas. You can add a layer of mulch over the leaves for a more orderly, finished impression. Most of us resort to the easier method of leaf clean up: the leaf blower. And while it’s tempting to use blowers to avoid the elbow grease, know that blowers are big contributor to soil compaction in your lawn and shrub beds. 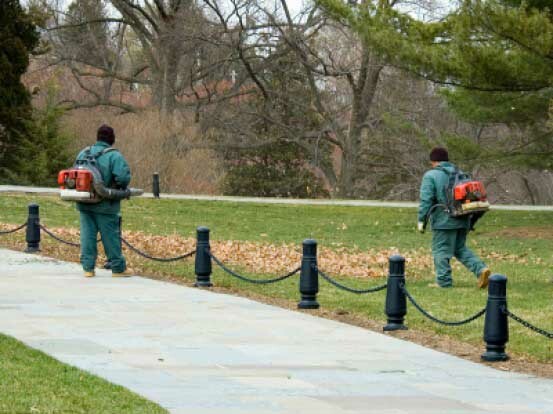 Leaf blowers are best used on hardscape areas such as sidewalks and patios. If you use a blower on your lawn or in landscape beds, try to keep it to a minimum and don’t use the blower on the high setting. Get out the hand rake now and then to manually remove leaves from the lawn and beds to reduce soil compaction and burn off a few extra calories! A little effort is worth the rewards of a healthy landscape that resists disease and rewards us with beauty, not to mention clean air.